Indisputable Evidence of @akarantain Being an Intentional Art Plagiarist and a Poseur. Due to recent confusion about a certain case we brought forward, we wanted to do our best to show indisputable evidence that supports our assertions. Our goal here is to bring facts to light to then let curators and users make personal decisions of what they would like to support. 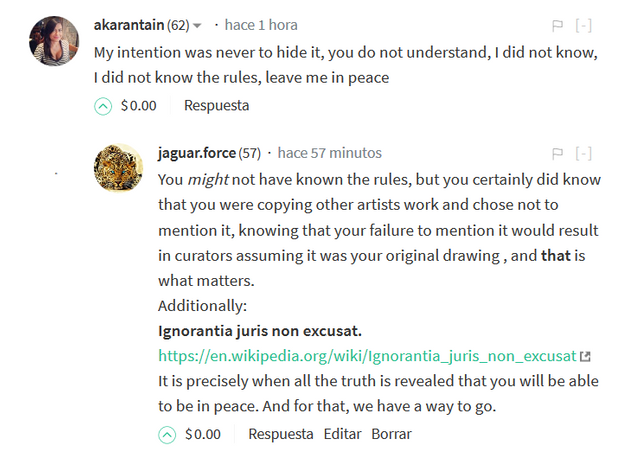 In one of the latest reports (https://steemit.com/abuse/@jaguar.force/art-plagiarism-case-8-caso-de-plagio-artistico-8-akarantain) a case of art plagiarism was revealed and edits were then done to add in the reference image that was used as “inspiration”. While if this was the only time this situation had occurred it could be seen as simply “not knowing” and trying to fix the mistake, when the situation happens repeatedly and the artist claims, when asked, that indeed it is an original artwork, things have to be considered. It is important to emphasize that inserting a source in posts past payout and after it being revealed does not change the possible attempt at deception. In the process of reviewing these edits (21 in total) another fact became evident, and it is why we are bringing it forward now as it can be seen as indisputable evidence of an attempt to deceive curators and viewers. While many times an artist simply may not know, when it’s done repeatedly, “I didn't know” or “it wasn't my intention” is hard to stand behind. 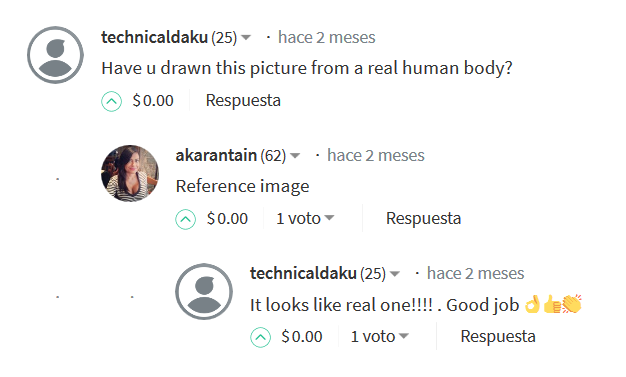 Yes, as you can see, in the very post that the user now admits was made using the now inserted source as reference, she replies to the commenter that the drawing was made using a real human body as reference, only to be edited today to read “reference image”. When this editing takes place to change the original conversation and context of the post, one has to wonder the intent. While art is not black and white, stating one thing and changing it after it was called into question is a valid reason to wonder if the intent was there all along. It is our job to report. It is up to you, the community to decide if this is something we want to be rewarding. Many curation groups have chosen to blacklist the user based on this sort of behavior, many may find it completely acceptable. Our job is to report the facts and we will continue to do so. Whenever I see someone "policing" the world (or a tiny fraction of it) like this, it makes me think of the stories my grandfather told me of the Nazi Regime, that had targeted him as "Volksschädling" (enemy of the people... actually quite an honor today). The Nazis too prided themselves to rid the world of "waste", pointing their fingers to what they thought was wrong and always claimed to have whatever evidence was needed to support their sick cause. Roland Freisler comes to mind with his arrogant and complacent way of prosecuting those opposing the system in which he felt strong. So, I wonder what joy you get from hammering down on someone who enjoys drawing and creating what they like. I find it particularly pathetic to attack someone who will not be able to put up much of a defense or even retaliate. Don't you think, people in Venezuela for instance have enough to worry about? Why don't you take on a real enemy? If you want to be the hero, you should fight someone strong and with the means to jeopardize your own position.. dig up some real and damaging mischief and abuse. 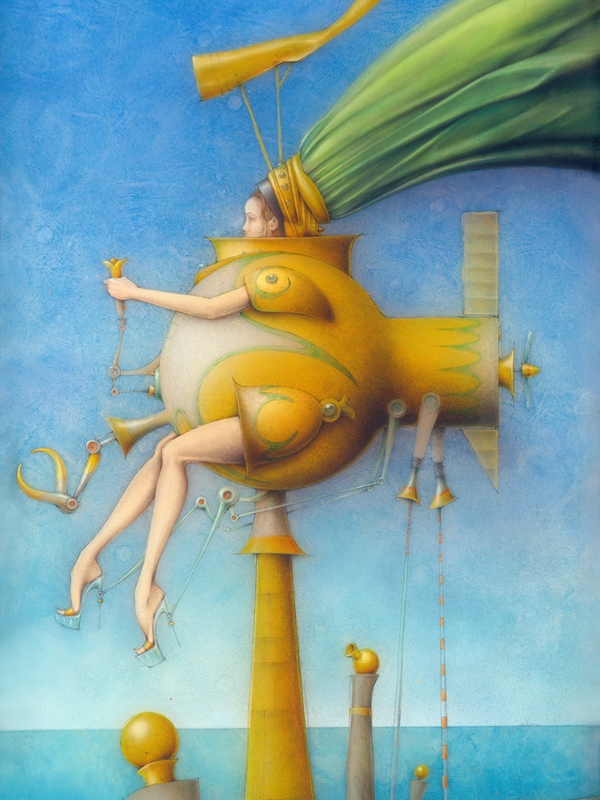 Demonstrate your cause at the top art fairs and exhibitions of the world. You will find plenty to reveal. And there its about big money... not just a few upvotes, that might grant some little guy just that tiny bit to carry on. This is a nice piece of art you did. How would you like if I made a post and said it was mine and got paid $50 for it? I see your point. If you just took it as is, posted it as your own and got lots of rewards for it, I'd send you a friendly warning, asking to reveal the truth and donate the money to a good cause. If you took the time and effort to draw your own copy, I might actually feel flattered, because it would indeed have to be a considerable effort to do a decent job. I would still try to educate you on copyright and ask you to tell what your source is, but I would not try to make you feel bad about it. Creating something beautiful is hard enough, so I would always try to encourage and if necessary suggest some guidance in the right direction. I have posted my work on the internet since 1994 if I remember correctly. Its been downloaded and copied countless times. People have shown it as their own. People take photos of it in my gallery and print it out and frame it. There you could say its really a kind of theft, as I don't get the payment I should have for that.... what am I gonna do. I can't call the police every time and so I look at it as a kind of "cost" for promotion. My art is distributed and shown around. OK, not necessarily the way you want, but there is always a chance, that someone who really likes it sees my art and investigates a little to find me and actually purchases an original. It has happened. In this scenario you have the advantage of knowing it was done. In reality the authors almost never know. On Steem people are being paid, it is different than someone just taking it and using it in their blog. I'm all with you! And the fact, that its all recorded gives the opportunity to react. The question remains for me, what an adequate reaction looks like. And of course everyone has their own idea about that. All I plead for is, what we call "Verhältnismäßtigkeit der Mittel" (proportionality of means). Therefore I would like to see a distinction between simply taking (with little or no change) and something done with a certain effort involved. I'm not saying to "let go" of wrong doing. I'm saying, lets all go reasonably about it. Meaning, yes, go after notorious violators of rules and community standards. But give someone a chance first to correct a mistake and to learn and improve. To me it looks like @lamouthe and @anthonyadavisii have added some valid points, seeing the issue from different angles and bringing two voices of reason into the discussion. But give someone a chance first to correct a mistake and to learn and improve. Most people doing this on Steemit will deny they did anything wrong and that it is their work. As someone who fights abuse daily, this is true 95% of the time. There is financial incentive to every action here. Most are here to take advantage of that regardless of ethics. It’s hard to prevent that at the same time giving people infinite chances and benefit of the doubt. I wouldn’t be so against someone if they took another persons work as inspiration and made their own version of it (unless they traced it or used other means that make this trivial) and submitted and disclosed it as such. If someone is undiscerning, I agree with you completely. Would not have thought the situation is this bad, as I would expect, that anybody in their right mind would correct a mistake, when given the chance. And I'm not asking for infinite chances. Of course there has to be improvement. I could be completely misjudging the situation, but when a fellow steemian edits a post after being made aware of a wrongdoing, could that not be seen as "correcting" of the very issue? Particularly, when that person from then on respects the rules? You are misinformed, the user didnt edit those 21 posts when told the references needed to be cited on January 5, the user only did so after the posts were revealed in our reports, almost a month after. Particularly, when that person from then on respects the rules? Even if the person would be respecting the rules now(which you cannot assert with confidence), given that it was proven the user lied about the artwork mentioned in the post not being made from a reference image it is well established that the user intentionally omitted to mention it not because of inadvertance but with the intent to deceive. Hence, even if the user would be following the rules now, that fact has no merit or virtue and it is in no way redeeming for there is no merit or virtue in correcting something when forced to. We report facts, if you dont like those facts that's not our problem. Thank you for your opinion. Of course you have the right to do so and you are right, what I think about it is in fact insignificant. I just wonder, why you go about it in a way, that appears somewhat aggressive. When I look at your profiles, you seem like the same decent and good hearted people, who feel alienated by your actions right now. @ailindigo, you are an artist yourself and i understand, that with your photography you are concerned about copyright. And although it might not always sound like it in the comments I see, I am sure, it is a serious issue for every serious content creator. @guiltyparties, if I see it correctly, you are a veteran? At least your blog leads me to believe you are. I served on a (German) Submarine myself for 4 years during cold war and I know what it means to be in the armed forces, even without seeing real combat. You have my respect! My question remains, why all this has to go out of hand like this. In Germany we have a saying that goes something like: "don't shoot sparrows with a cannon". What I'm trying to say is, I think your intentions are noble, but maybe the method is a bit... how should I say... exaggerated for lack of a better word (English isn't my native language). I have seen much bigger cases of abuse on steemit than a few kids copying a drawing. And why not talk to them first, when you see they are violating a rule? It might not even be with bad intentions. One could just as well contact them with a polite "warning" and give them the opportunity to correct their mistake. Of course, when someone is a notorious thief or abuser, stronger action might be necessary... and for that, the steem community has some tools in place already. So, why don't we all calm down a bit. You could still find the things you think are not right. But why not work with these people, instead of against them? Educate instead of making someone feel bad. Any decent soldier I ever met, knows the value of peace just like every decent artist. How can we dream of world peace, when a few folks on a tiny social network can't get along? I like your soldier analogy, Reinhard. Correct. Of all the things I've done and been in my life, I can relate. I was in the Austrian Air Force in my youth. It doesn't compare to your experiences though - I wound up being a pencil-pusher at Headquarters, so I quit. But being a railroader later on in Canada, outdoor often in Winter, was probably a better field experience. And yes, eventually and concurrently, I was and am a artist. And I always have a soft spot for those that are weak and defenseless. To relentlessly attack and keep kicking them while they are down is the action of cowards. There are bigger fish to fry than going after young artists trying to learn the craft and maybe making small mistakes - and I have yet to chide anyone that copied my work, except on those occasions where someone had ripped off my images for commercial purposes. So I filed a take-down notice (find out how). Copy me all you want, but don't sell t-shirts with my art on it! When I talk about bigger fish - look at the art market today, Koons, Hirst, even Warhol (rest his soul) and the successive copies of Duchamp's urinals. Brave guys here, taking on little artists. At least I can say that the foes I fight (in my blogs) are the big boys I named above. Just one of many: LAOKOON, ANTI-LAOKOON and ANTI-KOONS. Anyone that knows me also knows where I've been and what I am talking about. Steemit is but a small side-track for me. SUSANNAH MARTIN ARTICLE IN HUFFINGTON POST HIT BY FACEBOOK CENSORSHIP (and subsequently having 2 of my accounts locked up) to be confronted here with similar small-minded trolls. I thought Steemit would be a better place, but what I see is greed and spitefulness taking over. There are almost more wars fought here than actual constructive and interesting postings - something that is not easy to find among the trending fluff (where the hell are all these votes coming from - and how do they affect the pool for the little guys?) - but yes, go ahead and punish the little guys and take away the few pennies from their posts. If by young artists you are referring to the 40 year old user @akarantain, well... 40 years of lifetime is enough to be expected to know that taking the work of others, passing it as yours and trying to profit from it is wrong... and if the user didnt learn it in 40 years, she probably never will. Additionally, take into account the user has been in steem for 15 months. We believe you refuse to see what is in plain sight, that this is a case of serial, intentional, premeditated art plagiarism, the evidence above shows that without a shade of a doubt, but you still refuse to see it. It seems to be true that "there is no one more blind than the one that doesnt want to see" and it seems to apply perfectly to your case. This is not a small mistake sir, this is intentional, premeditated deception by a poseur and you are condoning it. We highly respect you as an artist but you are defending the indefensible and we strongly disagree with you in this regard. Never in my life I could dedicate myself to drawing and much less to a professional level due to personal circumstances I actually graduated in administration and in steemit I was able to develop one of my biggest hobbies. Do not talk about me if you do not know me. What part of what is asserted is not true? First it was "my intention was never to hide it", now that has been proven to be a lie, what's your next excuse Ms.? Hello, sir @reinhard-schmid. Yes, it is a serious issue for every serious content creator, and it is because of that that I couldn't take this so lightly and think any serious content creator shouldn't either. I wouldn't be happy if I see someone posting a photograph of mine as his/hers, I wouldn't be happy if I see someone making a reproduction of a photograph of mine as a drawing and saying it's from her/his when asked (as you read in this post), and I wouldn't trust this person at all if I see that she/he deleted a comment in which she/he lied (almost automatically it seems, I would say). Even if this person gets just 5$ or 50$ it is bad, it's not just about the money. Sir, we have been fighting abuse for a long time and this is a common and expected behavior and reaction, you might think our method is a bit tough but that's what it is, just a method, our experience has told us that educating or talking/correcting via DM doesn't work, not with malicious people, and this person has made the same mistake more than 3 times and even lied about it. You might think this is too small or silly but if we allow "little things" like this what can we expect in the future? We are just long term thinkers and that is why we created this organization, we believe in a serious platform with only serious people that have integrity and ethics. We do dream of a world of peace in which we all can get along and in order to achieve that there are things that need to be fixed. I am giving this a lot of thought. What you have to say and also the rest of this rather heated discussion. To the point, that it is distracting me from my work. You have made your point and it was probably important to have this debate. For me it has been a big learning experience in many aspects. I do appreciate all my colleagues loyal attempt to help each other, even with some of them being rather... how should I say... passionate. Artists are very emotional and they should be. Abuse is a serious issue and I would expect, that a majority of the steem community would agree, that it has to be kept under control. On the other hand, a significant part of the artist community agrees, that certain cases of "copying" are tolerated, sometimes actually encouraged, i. e. as an educational tool. It looks, like so far you have done your homework and I'm not debating your facts. But although I've been proven wrong a time or two, I believe in the good of people and hope all this will lead to better communication between all parties involved and yes, integrity and ethics. And with all seriousness, please leave a little room for joy and humor. @jaguar.force, your job? Who exactly are you? Please leave the artists in peace to create and present their artwork in the platform. Yes sometimes we get inspired by other images and yes sometimes we steal ideas from other artists because we like them. This is what art is, if you want to accuse other artists for plagiarism you must go as far as 1000 of years ago. When the Romans stole the ideas of Greek artists and even as far as 100.000 years when the cavemen stole the buffalo mural ideas from each other. Your behaviour is boarderline fascist and evil, i support @akarantain 100%. Dont try to scare artists, they are the most vital part at the @steemit community. Thank you for your opinion and have a wonderful day. You've really stepped into the "thick of it" with the art plagiarism issue and it looks like you have a few artists ready to grab pitchforks and torches. It is indeed a sensitive issue and glad you are prompting meaningful discussion. Is it problematic for artists to intentional deceive users to give a more favorable impression of their work? Yes, 100% agree that this action should be frowned upon from the community especially from honest artists as they would be the most affected. Do I believe your response may be somewhat disproportional? Maybe so. I think the act of deception should be attacked but personally I am more inclined to desire to forgive and reconcile the community with the person. What I try to see is the potential value the user may bring to the network if they are shown grace. I would try not to attack the character but behavior. There are some users that will mistake an abuse fighters' kindness for weakness and that is why follow up is all the more critical to make sure they have not reverted to their old ways. I also think it is perfectly reasonable for artists to include sources of inspiration when appropriate. In the cases we have discussed, think it is perfectly reasonable to have that requirement. Maybe fan art would be an exception and other cases where the inspiration for the work exceeds 10 or more sources such as sort sort of inspired compilation. I think giving a pass on those would be fine. We don't want to put up a barrier that is too stringent so artists would be afraid to contribute but at the same time there needs to be some standard for inspired works. I hope you and the parties striving against you come to some sort of resolution. I think there is validity on both sides and seems to be just a matter of finding the middle ground. I probably come a little late on this "debate", not being so active lately ... We were asked on the French channel to give our opinion and I decided to come and share with you my personal opinion which is not necessarily that of the entire French community. So I speak in my own name, but also as a french curator: fr and francostem (french part of steemstem community). So, sorry if my english is not perfect, since this is not my first langage. I was reviewing the posts published by @akarantain and I took the time to read all the opinions given here to weigh the "pros" and "cons ", especially from other artists. As steemstem / francostem curator, plagiarism is something that I know well and that usually makes me angry. We do not take this lightly at all, and I think it is important to raise the debate. When I read a post and I find notions of plagiarism, it is a little "easy" since it is "copy-pasted": the author has made no effort of personal writing, he appropriates falsely the work of someone else. In another hand, when it comes to art, we are talking about a completely different subject. Several months ago, we blacklisted an artist because he literally published the productions of other authors as if it was his own. There, it was a real case of plagiarism that the author recognized. He also wrote an article explaining the why of how and also apologized to the community. There was no original production coming from him, he only posted pictures of other people as if it was his own work. In the case of @akarantain, she copies images she found on the net, but she publishes her own reproduction of the original work. It details each step, explains the processes it used, etc. It's her own work of reproduction that she present us. In this, the content can be considered as original and not as plagiarism. Especially since in art, the copy of existing work is considered as a process of learning necessary to the acquisition of techniques of drawings. This type of "copy" can not be considered, in my opinion, as plagiarism. If you really want to stay in the norms that have been enacted, it would be good to simply ask the author to quote his source of inspiration. Yet, it may cause some problems to all artists since many of their creation can come from… everything! I would've taken the reports more weight if the accusations were done recent posts of the accused. 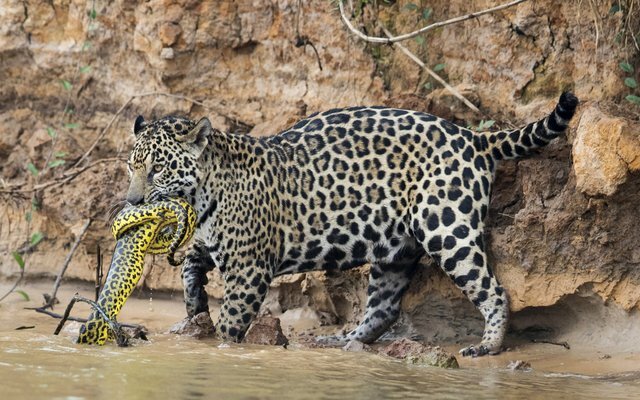 I don't see Jaguar commenting on recent posts of akarantain. 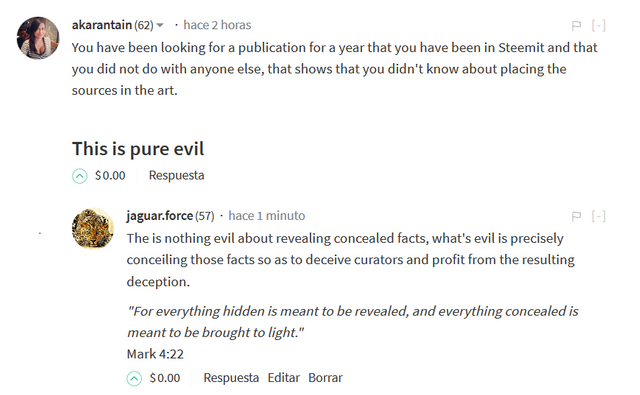 Either the user now posts novel art or Jaguar has yet to find evidence. It's one thing to comment on the actual post that is believe to have created plagiarism, it's another thing to make a blog post separate for the purpose of publishing how effective they are at both investigating facts that can subsequently shame people out. Given that these efforts are backed by people with high SP, no doubt that their point of view regarding the issue would be more prominent. As I have said quite a few times since January 5, 2019 I began to place the reference images if I use them because I see no problem in doing so in 1 year of being in the community I was never informed of that rule until I wrote in a veryspider comment that I should place the reference images when using but I did not know that veryspider after that day she next to the jaguar.force that this one in turn supported by people of weight of the platform of steemit and to use some of my post to destroy my reputation I have thought that it did it because some time I commented to him in discord that it is difficult for me to express myself because I have panic to the people and turned me into an easy target. Veryspider told me to continue and that from now on I would place the reference images, that's why I had not placed the reference images to my old post, then I correct it and also attack me, so they wanted me. That's the question I ask myself every day? I suffer from nerves this has done me a great physical and emotional damage and my panic towards people is now greater. 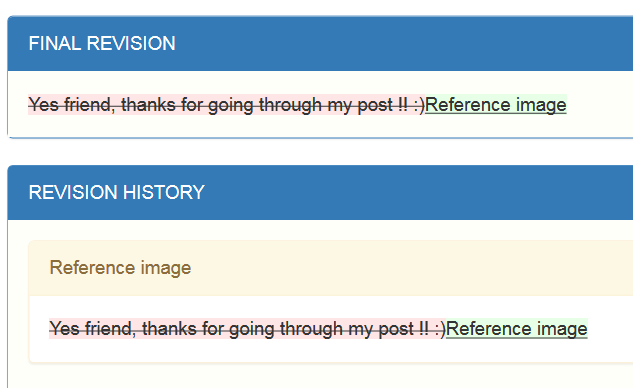 The short version of the story is that you made the corrections to put the reference images after you were told. But during that time, Jaguar didn't really care about the current posting behaviors and went out on posts where you still didn't know what you're doing was wrong and unable to correct those mistakes. That's unfortunate. Like I said before, I would've taken Jaguar's reports more weight if your recent posts were proven plagiarized but those case samples happened months ago. That really ignores what kind of artist you've become now and that's were partialism comes in during the investigation. I'm expecting Jaguar would make a generic response with a have a good day or thank you for your opinion on their subsequent replies if they ever make one. It should've stop you from posting if you know it's your art. As for veryspider's involvement, I wouldn't take that much into account. Veryspider is just doing what any responsible curator would do. It's Jaguar's approach in handling plagiarism that needs improvement. It says in the hyperlink right below it. just linking the image is not good enough, you have to name your source (i.e. a text link underneath) - that's the rules frequently cited by @steemcleaners. If you write a academic paper, you have to put it into numbered footnotes. Otherwise, it is a fail. See how this is handled on Wikipedia (theirs are similar rules about sources). Better yet, if you are so clever, come up with your own artwork for a change before you criticize artists. 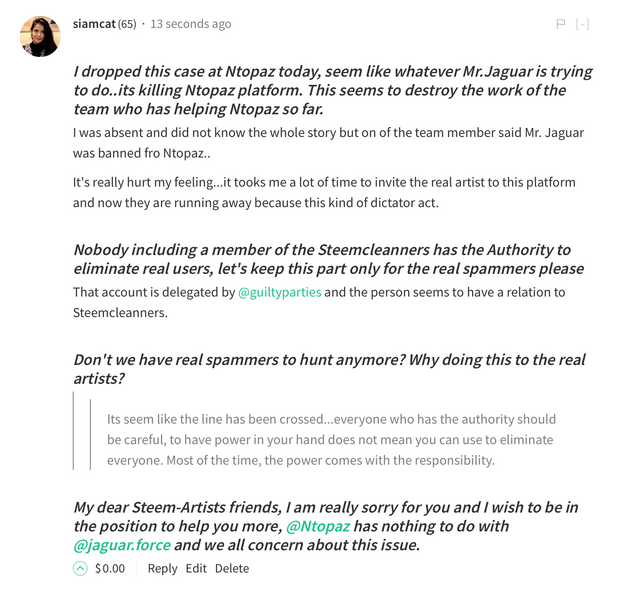 Thank you for your opinion, please go ahead and report this to SteemCleaners. Not to worry, Otto. don't think anyone who knows you, could ever call you a hypocrite :-) I know, your heart is in the right place. I have seen you more than one time jump to the aid of a fellow artist and I'd challenge anyone to find somebody who has put in more effort to support your the artist community. Your visonary platform is legendary and you are one of the most supportive networkers I ever had the privilege to know personally. I take this all as a big learning experience. Now that everybody got their blood pressure under control, and as you have said in a different place, we should go and create some art! 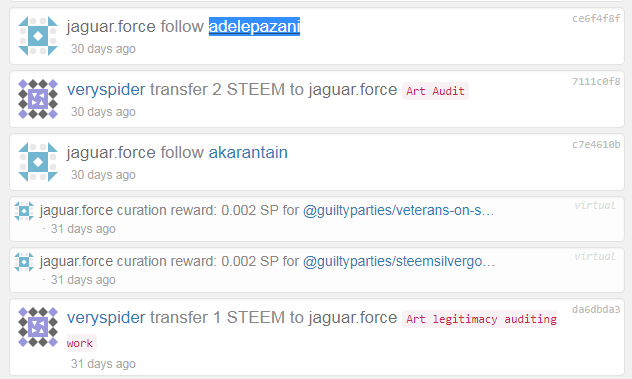 No No, you say Jaguar Force is violating the SteemCleaners rules, lets see if you are right... Please report it to them. We urge you to do it. Jaguar Force is not above the rules, the rules apply to everyone. One of the definitions of hypocrisy is empty talk, let see if your accusation is real or empty, please report it. Or are you just talking to talk?? I'm your FAN No. 1..! Thank you, it is very recomforting to see somebody express their support publically. You are welcome, maybe people do not like your style, but I think it's necessary. New York would not be the city it is, if Guliani had not applied the policy of "zero tolerance"
Please kindly read my comment here..your are destroying Ntopaz and we all are concern about this case, thank you! Every artist begins by copying what is accepted. Then subsequently innovate from that copied work with their own style. As long as they made something new from an existing inspiration, it's innovation and not really plagiarism. Pepsi is a beverage plagiarist with your logic. I suppose even the Old Masters are plagiarists for copying their previous master's work with your logic. Image plagiarism in the platform is rampant and continues to exist despite efforts to stomp out fraud visual artists. #photography #foodphotography #art and other visual art related tag contains a lot of authors that fake their content. They rob the real content owners of recognition and rewards they deserve and worked hard for. Fakes that are caught with a simple reverse image search from Google have little creativity to hide their abuse. But the good ones are those that hardly get caught. Successful plagiarists are not the ones you can catch with an SEO verification tool. These are content fakers that intentionally copy and alter some other person’s content and claim it as their own. Well, not entirely. These fakers are getting better and better at the crime of stealing original works and pose as the original creator. There’s not one hit solution in fighting abuse and I think abuse fighter should be as creative as offenders in their fight. The only wrong I she did was not citing the source of her inspiration. What she's doing is part of what any beginning artist would likely do Copy and then internalized their own version until they find their preferred form. When I wrote that post, I wrote it thinking about blatant plagiarism post, those that just copy and paste with added filters on their post. No real effort like starting from scratch and built your own style to it. There are worst cases and those are the lazy ones who don't bother to edit. I read your mentioned link prior to commenting and with those definitions, I'm also plagiarist. My art style can include some Tim Burton inspired works but I didn't stare at an image long just to get every bit of detail onto it, just the impression. I still copied the style and turned it into my own. Some of my works were also inspired by tribal drawings with modern tattoo-ish accents. You see the dragon image I frequently repost. The style came from multiple inspirations that it's impractical to cite some anatomy books and coloring books. In short, I learned from those that came before me. Sounds like the Old masters learning from their predecessors. You can even say Sakimichan, and all the other fan artists out there are plagiarists with those definitions. You even mentioned fan art being a tolerated offense, that implies it's still an offense, might as well hound the fan artists that will post in the platform on your list too. There's nothing original about my works. It's been done before. The difference is I made it and I didn't go online to look for the same idea. By the time I made some of my works and published them online, someone else from some unknown location and distant date beat me to the composition, content, and form of it but the difference is I made the piece. It's not rare for an artist to create works they don't know other artists already did so. They could draw up from the same inspirations and by coincidence come up with a similar outcome but not necessarily an intent of plagiarism. What do you think about this case? Aoi Ogata and Kyrie Which one do you think is a plagiarist? I'll save you the story. The former came first and the latter was taught by the former and now it's difficult to tell which one apart without the mark. Are they plagiarizing each other? I'm learning from their works and slowly adapting their style, I'm also trying to learn from WLOP. My latest work was inspired by those two artists based from the impression I got from watching their works. The first art post I published on steem blockchain orginally resembled Red Riding Hood doodle. Didn't think I was already committing plagiarism by your standards. I appreciate your effort of trying to rid the platform or art plagiarism but your approach is doing more harm than good. The art community has already made their statement about approach and it's clear that it's not the way to go. I look at Akarantain as an artist that just emulates other people's works until she learns to find her own style. Part of her own training. I think it's more of a miscommunication of what expected from her. I do agree on the lack of mentioning the source of inspiration is disappointing but it's not a gross offense to merit this much attention. When posting content that either is owned by someone else or inspired by someone else’s works, it is proper to list the said source in your post with a link to the original. Failing to do so is considered plagiarism, and could result in being blacklisted by curation groups or even flagged. Using another artist's original drawing/painting/digital art as a “study” or inspiration without linking the original and giving credit to the original artist. Linking to someone else’s YouTube video with no source. Using someone else’s photos or text without linking to the original source etc. Please make sure you do so in the future, thank you. Hi Sources, we love you! !